NASA's space shuttle prototype, Enterprise, now belongs to the Intrepid Sea, Air & Space Museum in New York City. Space agency leaders and local elected officials marked the shuttle's transfer of ownership, which took place last month, during a ceremony held Sunday (Dec. 11) onboard the aircraft carrier-turned-museum. 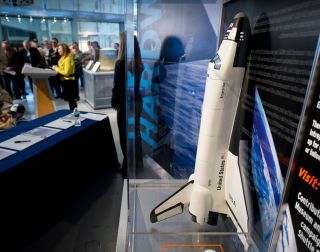 "Let there be no bones about it, the Intrepid now officially owns a space shuttle and that's going to stay for a very long time to come," Senator Charles Schumer (D-N.Y.) said during the event. Sunday's celebration saw NASA deputy administrator Lori Garver sign an enlargement of the "Assignment of Title" as well as other ceremonial documents. Intrepid president Susan Marenoff-Zausner also signed, together with guest witnesses Schumer, N.Y. State Assemblyman Michael DenDekker, and museum co-chairman Charles de Gunzburg. "It's NASA's pleasure to transfer to Intrepid the title to the space shuttle Enterprise," Garver said Sunday. "With the last flight of the space shuttle program in July, the shuttle era came to an end, but that won't stop these marvelous spacecraft from inspiring millions of people from around the world who will visit them in the geographically diverse areas that will house them." NASA announced in April that the Intrepid was one of four institutions nationwide to receive a shuttle. The agency's three space-flown orbiters will be displayed at museums in California, Florida and Virginia. Enterprise, which was used for approach and landing tests in the late 1970s, will move from its current exhibit at the Smithsonian National Air and Space Museum's Steven F. Udvar-Hazy Center in Chantilly, Va. to New York next April. The shuttle will be flown from Washington's Dulles Airport to JFK International Airport atop NASA's modified Boeing 747 shuttle carrier aircraft. Enterprise will then be transported during the summer of 2012 by barge to the Intrepid museum complex located at Pier 86 of Hudson River Park, and placed on the aircraft carrier's flight deck under a protective covering. The public will have the opportunity to see the shuttle while visiting the museum. Enterprise's flight deck display however, is intended to be temporary. The Intrepid is planning to build an $85 million new museum facility located across the street from the pier in what is now an empty lot owned by the state. Intrepid is Enterprise's third owner. Built between 1974 and 1976, the prototype was used to test critical phases of landing and other aspects of shuttle preparations. Although not outfitted to launch into space, Enterprise conducted 16 atmospheric flight tests — from taxi to active free flight — including eight tests manned by two teams of two NASA astronauts each. After serving as a test and fit check vehicle for the first launch of the space shuttle, and briefly touring Europe and the 1984 World's Fair in New Orleans, Enterprise was next transferred to the Smithsonian in 1985. Since 2003, it has been the centerpiece of the institution's McDonnell Space Hangar at the Udvar-Hazy Center. The Smithsonian relinquished its ownership of Enterprise earlier this year in advance of NASA giving the test orbiter to the Intrepid and space shuttle Discovery to the National Air and Space Museum. "Enterprise played a key role in advancing technology for the benefit of humanity and will continue in her education and inspiration mission here on the Intrepid," Garver said. Sunday's event was the second of NASA's space shuttle title transfer ceremonies. The California Science Center in Los Angeles hosted a similar event in October to receive the title to shuttle Endeavour.